At Puget Sound Marijuana, we know that selection is key, which is why we stock more cannabis products than anyone in Edmonds, Mill Creek, or Shoreline. And while we love everything we stock, the budtenders at your favorite Lynnwood weed shop often come across strains with names so totally bonkers we can’t help but chuckle. Getting to check out all the goofy names vendors and growers come up with is one of our favorite things about legal recreational marijuana, and the hilarious variety is proof positive that marijuana is a boon to creativity. Here are some of the favorite monikers we’ve come across recently. 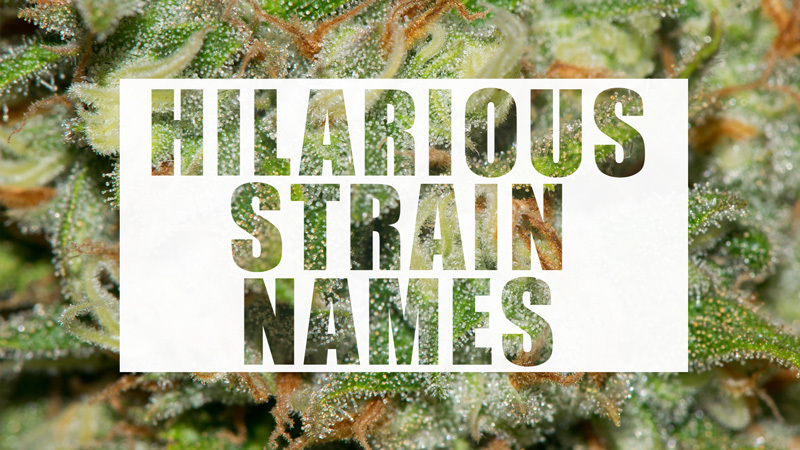 These strains are as fun to say as they are to smoke. With a name like Green Crack, you’d expect this strain to get you jacked, and it delivers. This high-powered sativa strain is strictly business and will keep you elevated and energized all day. It’s one of our favorite for outdoor projects and activities. We’re not sure how Farmer’s Distributors came up with the name Wa Woo Cookie, but we’re positive the inspiration came after a long smoke session. This hybrid is perfectly balanced between indica and sativa, so you can enjoy a nice, heady buzz without fear of couch lock. With his zen-like calm and wicked lightsaber skills, this ancient Jedi master is one of the coolest characters in the Star Wars universe, so it’s only fitting he’s been honored with a strain. One toke of this super-potent bud, and you’ll be feeling like you could lift an X-Wing fighter with your mind. For some reason, this name makes us think of a totally hopping south-of-the-border spot with amazing pastor and a kicking mariachi band. Smoke a bunch of this strain, and you’ll be rocking a buzz that’ll keep you cool, collected, and ready to tackle anything the day puts in front of you. Viva Pepe! It’s a bold stance to name your strain after the son of God, but when it’s as good as this strong, lemony, sativa-dominant hybrid, nobody is going to complain. We like to think Jesus was named for what the growers said the first time they smoked this wicked combination of Hell’s Angel OG and Jack the Ripper.